I think I’ve managed a first for me in my challenge reading. 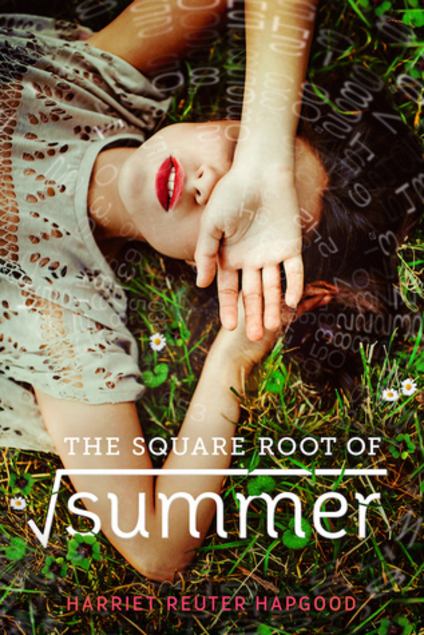 I put The Square-Root of Summer by Harriet Reuter Hapgood on my random To-Read list on my phone (I think I stumbled on a blog post review while at work—more on that later, and why it really was work). I requested it from the library without remembering it clearly—and found myself stumbling accidentally into a parallel universe novel! Gottie’s world is coming apart. Literally. Seventeen, on the cusp of needing to figure out what to do with her life (or at least whether to go to college), Gottie’s attention is focused on the past. On her grandfather’s death almost a year previously. On the return of her childhood friend Thomas, out of touch across an ocean for five years. On the memories of her secret summer fling last year with her brother’s friend. And all around her, wormholes are opening up, sending her hurtling back into the past. First, the mechanics of this. I never quite got them, even though Gottie is a math genius who spends a lot of time discussing equations and theories. But in practical and storytelling terms, the point is that she’s periodically encountering wormholes which send her mentally (but not physically) flashing back to earlier points in her life. As the novel progresses, the effects become more dramatic, until she’s physically moving to parallel lives, not moving through time but moving to a universe where an earlier choice caused a change. And ultimately cause and effect become confused, and things like writing an email response turns out to be the message that inspired the email that she was responding to. If you see what I mean. Like I said, I never quite followed it. But there was time travel and parallel universes and it was all used to really interesting effect to tell a nonlinear story. It’s also never quite determined how much Gottie’s emotions influence the whole thing. And she’s riding serious emotions, deeply grieving the loss of her grandfather. On some level she’s also grieving her summer fling, but the two are intertwined and I always took her grandfather’s death as preeminent. I’m almost sure that grief angle is how I found this book to begin with. I work in marketing for a hospice, which means I read a lot of articles about end of life and grief (not as depressing as it sounds). I’m pretty sure I encountered a review of this book while reading about grief—although I don’t really remember. I read a lot of articles, and things can sit in my phone To-Read list for a long time. I don’t know that this book does an amazing job on the grief aspect, but it does do some interesting things. The flashes into the past, Gottie’s zoning out (to others’ perspective) while she’s mentally in the past, do certainly reflect the grieving experience. Other parts of the book—her uncertainty about the future, her conflicted feelings about her past fling—seem to me to be clearly influenced by her grief, but that was never drawn out as overtly as I think I would have liked (especially in a YA book, whose readers—hopefully—have less knowledge around grief and may not pick up the subtleties). None of the characters stood out hugely to me here, although they were perfectly good and interesting while I was reading about them. Gottie’s grandfather, very present in references and occasionally flashbacks, sounds like a splendidly colorful figure, and I especially liked Gottie’s childhood friend too. Like too many YA books there is a love triangle in here, but it was all so complicated that it felt different enough—Gottie’s “present” romance with her past fling is only happening in wormhole visits to the past, so it’s almost more a story of moving on from a past relationship rather than a true triangle. A nice addition to my parallel universe reading for the year—and probably the most mathematical, despite having one of the least clear theories!